Inspiring women are go-getters. They make things happen. They live life with no regrets. They are learning about themselves and reaching their full potential. They are not afraid to take risks and just go for it. 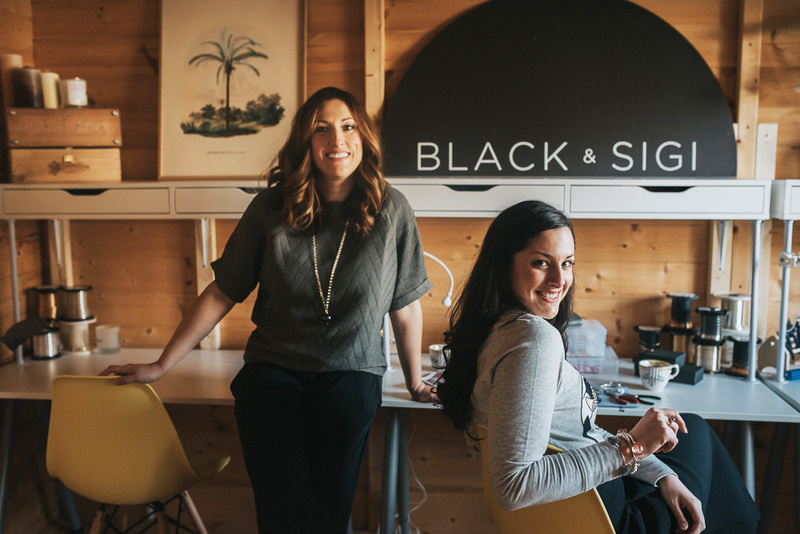 I talked to Clio and Athena from Black& Sigi, who decided to set up a jewellery business with a difference. It’s been a whirlwind of 2 years for us, that’s for sure. We have learnt a lot since we started the business and although we had some business knowledge, we were pretty naïve about the finer details of the industry. I suppose the turning point for us was when we received interest from our first boutique who had seen our products and wanted to stock us. It was at this point that we researched, asked a million questions and created a clear strategy of what we wanted to do and where we wanted to take our small and humble jewellery brand. Don’t get us wrong, we are still learning today and tweaking areas, and making mistakes ultimately, but it’s this part that makes you stronger and more determined to create the best possible opportunities. Now we are stocking in 10 shops ( and growing the list every month), partnering with online platforms such as Not On The High Street, Silkfred and Tarlee, and have developed our own website and social media to create a brand that we absolutely love. The journey has been great, and has only just begun for us! 2. What is different about your brand? We handmake each piece of our jewellery here in Essex, so in an already saturated market we can offer a more personalised element. Shopper’s habits are changing and they are choosing to support more independents, so are looking towards brands like Black and Sigi to accessorise themselves! We also like to think that our designs are unique and contemporary, which appeal to a crowd that want to wear something different. 3. What is your most popular product? Each season this may vary, but for sure the clear favourite of the moment is our Aphrodite Bangle and Aphrodite Ring from our classic Immortal collection. We love them and wear them ourselves on a daily basis. Style, for us, is about looking effortless, confident and uncomplicated. 5. How did you overcome the fear of failure and any insecurities you had while starting up? It’s completely normal to have insecurities when starting a business, we are sure everybody has experienced them at one point or another. We choose to look at the positives rather than concentrate on any negatives. Mistakes will be made, so rather than stress and cry about it, we use the lessons we learn to grow stronger. Not everyone will like your product ( this is NOT a failure, even though you might think it). The important thing to do is not concentrate on trying to please everyone but instead look at your market, know what they want and create for them. This for sure was an insecurity we had initially, we wanted to be liked by everyone and hence we stressed ourselves out if someone didn’t like our style. Now we simply use the analogy that “you wouldn’t buy a piece of jewellery from Black and Sigi, if you want Tiffanys”. For us it was the decision about investment. In order for us to have taken the brand to the next level, we had to find some extra cash from somewhere. We applied for a small loan, set up the website and bought in a small amount of stock. We had a lot of great advice, but one that sticks to mind was not to sell ourselves short. We remember when we were pricing up our items right at the start, we were so insecure about people purchasing that we completely underpriced the items. We were paying people to buy our things! Pricing is difficult and it can be calculated badly on both ends of the scale, so it is important to do your market research, know all your costs and go from there. To see the latest collection, please visit Black & Sigi website and don’t forget to follow her on Instagram.